In the last post I tried to unpack Thomas Aquinas’s Fifth Way of reasoning to the existence of God by the existence of consistent cause and effect (seeing teleology or final causation as just as real in the world as efficient causation). Of course, it’s not a proof, or if it is it’s one that doesn’t compel skeptics, which amounts to the same thing. But it is powerful, time-honoured and has never been refuted. It may surprise some, as it surprised me, that the Fifth Way makes allowance for chance as evidence for this aspect of causation. That is really to say, in other words, what I said about the clear distinction that needs to be made between chance, which exists in our world, and chaos (in its original meaning) which does not. Aquinas’s understanding of chance, of course, precedes the study of probability. The kind of example of chance he gave would be the equivalent of two planets proceeding in their orbits in strict conformity to the laws of gravity and motion (ie displaying the final causality or teleology inherent in those laws) and colliding at some remote date as their orbits happen to cross. This happenstance would not in any way undermine the Fifth Way: the laws still govern what “always or nearly always” happens to “natural bodies lacking intelligence”, and in that sense the collision of the planets is fortuitous and rare, not built into the teleology of those laws and so not “intended by nature.” Aquinas would, nevertheless, say that such events are governed by God’s providence, but that’s another discussion. But with the study of probability, it becomes possible to say not only that chance does not oppose the Fifth Way, but that it reinforces it, rendering chance a source of the metaphysical evidence for the intelligent design of the universe. One can quantify stochastic occurrences like the planetary collision above in the probablistic examination of a simple “chance” event like a coin toss, as an instance of the clear “intelligent design” of a random event in the world. In a recent post and in the ensuing discussion I suggested that tossing a coin is actually a highly-designed method of turning physically determined (non-random) events into a “random number” generator. Briefly to recapitulate, research has shown that a carefully made and set-up coin-tossing machine can predict the outcome every time by applying exactly the same forces in the same way. In other words, there are no forces that could be regarded as truly random within the process, such as quantum variations or chaotic (scientific usage in this case) events. However, in an actual, human, coin toss it is impossible to control either the initial conditions or the force of the toss exactly. Additionally, it appears there are usually two axes to the toss, and also if the coin is allowed to bounce on the ground, a significant “chaotic” (though physically deterministic) element is indeed introduced. 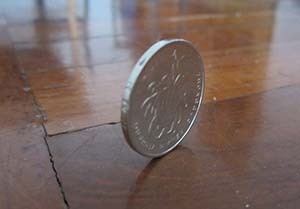 The net result is that the coin can make its final landing at any angle. But the coin itself, as a flat disc, is designed and made to resolve all angles into just two stable alternatives. And so we have designed a system to harness the various teleological forces we either create, or find in nature, to provide a probability distribution between heads and tails of 50:50, barring flukes like the one illustrated. The key point here is that the overall statistical ratio of “random” coin tosses of 1:1 is evidence of the teleology of the system (in this case owing to human design), in exactly the same way as that of the coin tossing machine that consistently gives the same result. The clue is in the probability distribution – a truly fortuitous process could have no such mathematical description. Things which lack intelligence, such as natural bodies, act for an end, and this is evident from their acting always, or nearly always, in the same way, so as to obtain the best result. So although the molecular movement may be seen as random, the very existence of Boyle’s law, mathematically relating pressure to volume, is as much a metaphysical argument for the existence of God as the laws of motion and, specifically, for his final causation of the behaviour of gases. This is no great surprise, any more than it would surprise one for an artist, painting a portrait, to fill a block of colour by “random” brush strokes. Considering a far more complex natural example, like the “randomization” involved in the mammalian immune system’s responsiveness to pretty well any pathogen, the same things are true. The system as a whole “always or nearly always” acts to the end of attacking pathogens, and is therefore comparable to any other instance of final causation, even if one were ignorant of the specific efficient causes involved in the “randomization” process or its development. Once could, however, be pretty sure that there were law-like processes involved even in that. As a final example one can consider quantum events, for which no efficient physical causation is (on most interpretations) permitted. The Fifth Way has no need to speculate on what makes an individual quantum event happen, because the statistical picture demonstrates that it is not fortuitous, but designed. How so? Take the example of radioactive decay, governed by quantum events in unstable nuclei. There is no way of knowing when any one atomic nucleus will decay, but nevertheless the overall process is quantifiable – the half life of any one isotope can be determined accurately enough to act as the basis for absolute geological chronology. For all that the efficient cause of each quantum event is unknowable, half of them will certainly occur in each half-life period. In a real sense it is clear that the quantum events are determined by the final causation of the process of radioactive decay, because en masse the particles will obey the mathematical law that describes that teleological process – quantum events are not fortuitous, or they would not be amenable to statistical study. That should, in itself, demonstrate the necessity of including final causation in science (efficient causes being opaque in quantum events). Indeed, like final causes generally, they are included (unconsciously), or “quantum statistical mechanics” would just be crazy talk about predicting the results of random events, of chaos reliably forming patterns. But it is also more evidence that chance, rigorously examined, has nothing to do with fortuitous causation, but with the quantifiable results of physical laws that are intrinsically teleological and therefore point to intelligent causation (with all that Aquinas concludes in that), unless one could finally refute the Fifth Way. Before I would venture into the deep end of this conversation, I wold like a (clear) answer (if I can state it like this) on your position regarding causality – just where is agency, and specifically human agency and intellect, fit in within your reasoning? GD, I’ll try to be clear but I may not be if I’ve wrongly guessed what you’re trying to ascertain. I take my categories from Aquinas, that is that causality is always material, formal, efficient and final. Inasmuch as human agents have conscious will, we normally major on final causation: that is we choose to achieve an end, and then we find means (covering the other categories) to do so. The same is true of God, conceived as an agent, though to him (as I commented re the previous post) efficient, formal and material causation are neither after nor before final causation – they are one simple act of creation. Aquinas has a broader view of “agency”, to include the secondary powers not only of animals (with regard to their limited goal-setting abilities) but also of other, mindless things – the internal teleology with which which these two posts have been concerned. These powers are given at creation, and are the main thing Aquinas uses as raw material for his Fifth Way. So somewhere in the chain of final causality, he says, if means meet regular ends (as in physical laws), there must be intelligent determination – hence his “therefore, God” conclusion. In the case of human actions, leaving aside God’s ultimate sovereignty, human will provides the intelligence required – the man firing an arrow at a target provides the finality imparted to the arrow. I don’t know how far that clarifies my position for you, but let me just add my reasoning on the “coin toss” example, in which I suggested that the chance involved was evidence for intelligent design by the same reasoning used in the Fifth Way. My point was, in short, that the coin-toss system is designed to produce “always, or nearly always” a probability distribution of 50:50. Therefore, although the design does not predict each outcome, the specific probability distribution of the system called “coin tossing” is a teleological matter: the outcomes are not “caused” by chance, which in this universe at least is not a “cause” of anything. This makes your position clear(er) and overall I agree with such reasoning – as you may realise, I try at times to focus on “physical science” as something that human beings do – this provides a (arbitrary) separation between the agent (scientist) and the object investigated. This, in a crude manner, provides the object investigated with “properties’ determined by the scientist. From such deductions (and I suppose abstractions) the human agent comes to believe he knows the properties of the thing examined. I will not go into further detail because I have stated my thesis regarding a human being in the world and I could bore people with repetition – nonetheless, an arrow and a bow cannot by themselves aim at anything – the same with a coin tossed. Regarding species in Nature, I tend to think their “final causation” may be to provide Nature itself with all that constitutes it – but this argument is more in line with the Creator and the creation, and human beings occupying a unique position within Nature. It is possible to think with Thomas on these matters, but I think he would only provide generalisations regarding the objects of physical science. The distinction I allude to is important imo as it enables us to see a difference between things caused by human beings, and the phenomenology that constitutes the activity of Nature. Chance is simply a term we as human beings apply within this; science has refined it and we have statistics and stochastic treatments, but these are created by us as part of our endeavours to understand the created world. I hope my scant comments are helpful to your post – but it is important to distinguish human agency when discussing teleology. Yup – I can go with that (basically) epistemological view on “chance”. Meanwhile God says, “I know why it happened, because I was its cause.” That reply would cover all of his providence, and in scientific terms particularly the secondary powers he puts into the creation. The point I’m really making is that the “chance” we describe is demonstrably part of the mathematical order of the secondary powers he creates, and not something chaotic apart from them – or even disorder that he can “use” as seems to be the position of the some of the BioLogos TEs. PS your point on the scientist’s deductions and abstractions reminds me of something I wanted to raise in the context of previous discussion (not yours) on distinguishing Aquinas’s “individual natures” from the universals of “laws”. Gravitational law talks about the effects of mass, whether in Newton’s terms or in relativity terms of its bending the space-time continuum. But “mass”, Higg’s boson notwithstanding, is a theoretical abstraction. One can describe, mathematically, the behaviour of two masses, but in real life no two “masses” have ever existed, let alone attracted each other: in every instance individual species possessing the quality of mass as an integral part of their natures have been involved (such as a sperm whale and a large planet, if you’re familiar with Douglas Adams). You can separate the terms of an equation from all dimensions not significant to gravity, but never a real planet or an actual whale. These exist in space-time, with their individual properties of mass and everything else inseparable. But where are the laws, other than in the minds of the human observer or, were he limited enough to think in those partial terms, in the mind of God? They are quite clearly as immaterial as any information is. A few comments – I consider creation by God as complete in that it is itself – another way of saying this is to think in terms of a complete thing we call creation, which includes all time, space, material and forces, and anything we understand as the Universe. So to us, time is unfolding, but in my view, to God, it is the alpha and omega in toto, or a complete thing to Him. “Where are the laws?” … we tend to say thoughts is this or that, but this amounts to words that we utter or write, which to us constitutes what we believe we have thought. The “laws” are thus articulations that we utter between ourselves, and as all language, we consider such things as meaningful within the context of language. It is at this point that I would fall back on distinctions between beliefs; a materialist would consider neural networks and such, to be thoughts, while I as a theists would consider meaning as that which consists of myself, soul, spirit, identify (what is captured by such words). Mass, particles, equations, and other terms that scientists use, are often “meaningful” to a particular practicing scientist, but not so much to others – I think that is why we refer to each other in terms of our daily activity. Chance is a very interesting notion – yes it may often mean our ignorance, but it may also show us that we are faced with inexhaustible possibilities and we realise particulars through our choice, intent and agency. These comments cover a very large area of human endeavour and I have not had time to edit my post – hopefully they are interesting enough to cover the typo and other errors. The “laws” are thus articulations that we utter between ourselves, and as all language, we consider such things as meaningful within the context of language. By which I understand that, faced with what one might call an irreducible totality in the creation, useful descriptions of how humans perceive may come in various (human) forms, none of which capture, but only illustrate, the reality. That would be true whether those descriptions are made in terms of laws, or of Aristotelian natures, or whatever else best addresses our interests. Even mythic or poetic descriptions, if our interest is meaning or feeling rather than measurement. In Mediaeval times many philosophers would have wanted no more than such “descriptions that work”, on the conviction that human limitations make a literal “thinking God’s thoughts after him” mere presumption. Nowadays intellectual vanity tends much more to the ambition “describing reality as it is” – in which case, the laws are seen as objectively real, and not merely mental constructs. So I’ll ask them, rather tham you, where these laws reside amongst the disparate particles of the mechanical universe! Not sure I agree there. There are those whose view of free will equates to chance contingency, their only alternative to “determinism”, but I’m not one of them. I see it as a third fundamental category. Doubtless choice involves selecting between endless alternatives, but is chance anywhere in that? The choices I have may be by influencing lawlike events: I halt the trajectory of a cricket ball with my hand; I leave a chair where it’s always stood. It’s harder to think of how choice interacts with chance, other than by prediction, which isn’t really choice: it will be heads, or the Ace of spades, or this experimental drug may cure rather than cure me, or this hole may reveal the buried treasure. How do you conceive of a link between chance and choice? A fascinating subject – choice and chance. If I restrict this conversation to the notion of I, as a human being, am in the world (but not of the world) of activities and objects (i.e. capable of choosing to sit, or stand, or to bring a chair, or not etc) than I would perceive all of my choices as distinct (and real) possibilities, but my choices will actualise only those I choose. The results may also be comprehended within this; I may sit, but miss the chair and fall, hurting myself. This is one of a number of possibilities. If I consider a number of human agents, it become complicated in that one person’s choice may impact on another’s – be it an ‘end result’ or otherwise. Our ignorance is not removed – this drug cured that person, but not the next – we do not accept this results as predetermined, but instead we ask why, because we believe the possibility of an answer is real. This is a limited discussion that links the world, human agency, chance and choice. Can we extend this to a world that displays regularities and seems set in these? One way is to see a distinction between a human being and the objects of his enquiries. I see where you’re coming from. In that sense the interruption of choice by other choice (or in fact by happenstance) is an instance of the kind of “Chance” that Aquinas treats as paradigmatic. In other words, two completely lawlike processes that happen to intersect are not involved (at the physical level) in finality, and so constitute “chance” interference with the teleology of the uninterrupted systems. The world is full of such interactions of final causes. Likewise, I guess, add in a couple of humans – say me choosing to drive east-west and your choosing to drive north-south – and we might “by chance” interfere with each other’s choice by crashing. Physically, though, we’re both exercising our choices through lawlike processes in the cars, so our “intelligent design” is metaphysically not that relevant to the discussion about finality. If, on the other hand, we have consciously opposed wills, I’d think that chance is even less relevant: if I form the goal of ruling Berlin, and you form the same goal for yourself so that we start tossing bombs at each other, the interference with our “final causes” is not by chance, but design. The role of God in all cases (not only according to Aquinas but, in my view, biblically) is that he stands before all these instances, whether of internal teleology or human “intelligent teleology”, providentially ordering them. The approach to chance that I’ve taken helps, I think, to account for God’s providence in “natural chance”, if only by saying that his complete knowledge is completely aware of all future outcomes of the “laws” – there is no elemet of fortuity. In this way the secondary powers of agents are entirely compatible with his overarching providence directing them to their ends. That softens the way for, at least, the principles by which human will may be free, but subject to God’s providence nevertheless. It certainly doesn’t go the whole way – for I think that’s not possible and must be taken on faith. But my comments above so suggest (to me at least) that we can say that when something happens to me “by chance” it’s absolutely consistent with a rational account of that’s being within God’s providence. I prefer to develop my thinking is small steps; we have dealt briefly with human agency and intent within the context of nature (or science laws if you wish). Before discussion providence and God’s sovereignty, I would instead look at human intent within the Law (do good to your neighbour), and how my actions may actualise. Take your example of driving our cars – say that I had found a way of doing something good for you, and to do this, I ask you to drive your car to point X, where I would be able to actualise my good intent. So far, we obey the laws of nature and also the Law of God in intent– unbeknown to me, your trip takes you across a railway crossing, and the rail at that point had been weakened by some natural event. Just by shear chance, the train derailed just as you were travelling to the crossing – you were traumatised, could not continue with your trip, and the result was the good I intended did not eventuate, but instead because of me you took a useless trip and was traumatised as a result. Now both of us intended the good, so we obeyed the Law stated in the Bible. Nature took its course, so no-one can say I planned the accident. Yet the outcome was other-then our plan. I am not making a statement regarding God, as I can easily argue that God understood what should occur far better then you and I. However within the human context, we would see intent, natural and man-made acts, outcomes, and chance – I restate that this is an example in which our intelligence is unable to fully comprehend all of the possibilities, but after the event, we can adopt a causal chain to understand the why and wherefore. We would also pray to God to help us to avoid such problems. It can also be argued that you and I met at point X and the good deed took place – no train was derailed, and we all thanked God for the outcome. To both of us, the good outcome would be consistent with planned intelligent teleology, while the unexpected outcome would be rationalised as accidental, unplanned and displayed our ignorance regarding the railway track – after all if I knew the railway track would lead to a derailment, I would not have chosen to ask you to travelled on that road. Likewise if you knew you would have chosen another road. OK – we restrict the discussion to human and natural systems at present, except insofar as God is the author of law. Your scenario still seems to be a case of the most fundamental type of “Thomistic” chance, which is purely epistemological. Physically speaking the new accidental factor – the failure of the railway track – was the product of whatever decay was going on it it through chemistry and physics, but occasioned by the driver’s happening to cross it at the point of failure. 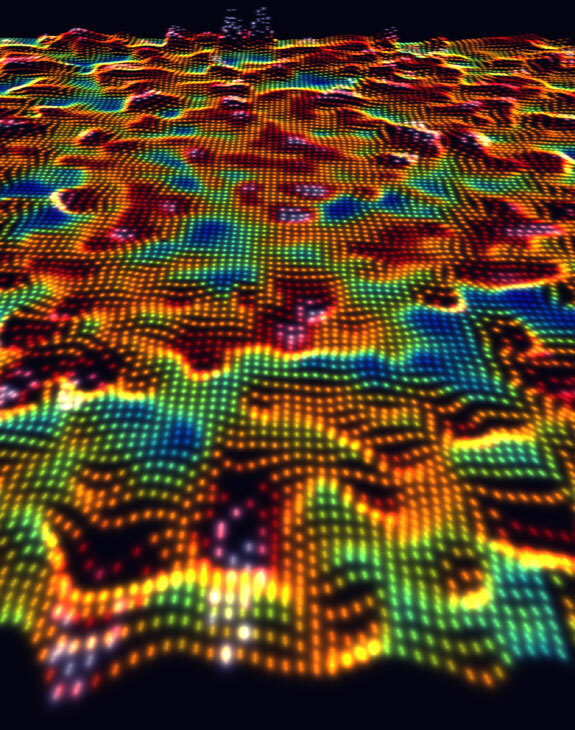 No physical laws were broken in the making of this movie – the science was deterministic. So we conclude “chance” is real in the experience of fallible humans, but only because of our limitations. Had we a complete knowledge of the universe, there would be no “chance” because the accident would have been predicted and/or avoided. Any chaotic (scientific use) elements in the system would simply require complete precision of that knowledge – no big issue since even without it such knowledge is not possible for us. I also omit quantum events since the individual efficient causes are unknown and, it seems, physically unknowable – but also they are of minimal significance in your scenario – Schrodinger’s cat was not in the car. The outstanding issue here would seem to be an apparent conflict between God’s moral law (promising rewards) and his natural laws (promising various outcomes) – obeying the first led to coming a cropper from (though not disobeying) the latter. That to me would be another good reason to be cautious about the use of “law” in the context of (theistic) science, except as a very loose analogy or working tool. Another example of such “conflict” would be the lion in the Colisseum obeying its nature, or its “law”, by munching a handy Christian, who is only there because of obeying God’s law. One could view that as “chance” in the same way as an asteroid devastating the earth is a chance conflict between the laws of gravity and inertia, but I don’t think it’s helpful as God’s laws don’t conflict – but the natures he gives to things might. It is in the nature of friction, for example, to oppose motion – but if you view it in terms of laws, there is no conflict, but just a combination of equations. I have accepted that if we knew the rail was warn out we would have made another choice – my comments are still restricted to intention(s) in the world, even if these are both informed by science, and informed by Faith and Biblical teachings, including the Law. This difference may be viewed as epistemological, but this leaves open a theoretical possibility that we may eventually know it all, and this should remove chance. I am suggesting that the creation is such that we may never, in our present condition, reach that state of knowledge. So how would this predicament be understood, unless we consider the world of inexhaustible possibilities, and that God may have created this to serve His purpose? If we philosophise, we would run into the difficult situation in which we may obtain a generalised view (e.g. Aristotle’s), but this I suggest may conflict with our common sense – or say instead, the wisdom that life and experience could bring to us. Thus I come back to intent and comprehension as a human being in this world, but not derived from the world as other molecules and species are – I mean I do not expect science or philosophy to bring me self-assurance, nor do I abandon my confidence, and turn to chance and some odd ‘fate’ the Greeks would consider. Now for the Christian and the hungry lion – both may wish it were otherwise – but a degenerate Roman wanted it like that. I think the Roman exercised his intent, and the Christian wished God would have changed the Roman and the lion so they would not see him eaten, but then, if it was to be, he would have asked God to accept his soul. We can see various intentions from humans, the lion simply says he is hungry, and the Roman enjoys himself. Should God join this group? I cannot say. Perhaps God’s ways are mysterious to us in the context of this discussion. I prefer to discuss human intention, before I think if it were wise to venture into what God should and should not do. This difference may be viewed as epistemological, but this leaves open a theoretical possibility that we may eventually know it all, and this should remove chance. I am suggesting that the creation is such that we may never, in our present condition, reach that state of knowledge. Such a theoretical possibility I would regard as a theoretical impossibility, because to know it all is to be omniscient, and to be omniscient you need be infinite, so you’d be also need to be God. All of which there are very good grounds for believing absolutely impossible. However, if we did become God, and omniscient, I grant that chance would disappear from the equation (which is also an argument against those sad souls who rob God of his omniscience by suggesting he takes risks, gets surprised by events and so on). In the human situation, chance of the kind you name being prevalent, trust in the goodness of God’s providence is central – and that in turn depends on knowing that, ultimately, circumstances are within his control. It may be of relatively minor import to die in a car crash on a crossing if you can trust that God will bring you to himself nevertheless, and maybe even bring some good out of it (for example, by saving the lives of 400 people on a train that would otherwise have crashed). But if he has no control over physical providence, there really are few grounds to believe he has any more ability to bring us to his presence against the powers, principalities and accidents of this world. My comments are all within the context that God is the Creator of all, and all is subject to His will and good pleasure – so I cannot add to your comments on this. You and I may agree that we as humans may never know it all, but tell that to some atheists! They would look to some mysterious science to know all that is worth knowing – yet if science could do that, some very clever people, such as Plato, Aristotle, and equally clever people nowadays, would have gotten there some time ago. Talk of belief? Try telling that to an information theorist! To know every event in the Universe, you need to have the resources of every event in the Universe. I guess some would say that’s not necessary because all you need to know to “know everything” is every law under which it’s operating. But that of course means you know everything and nothing – sophisticated abstraction but zilch about actual things. So chance would still catch you out even with your theory of everything. Anyway, I think we needn’t hold our breath for someone to claim universal knowledge.